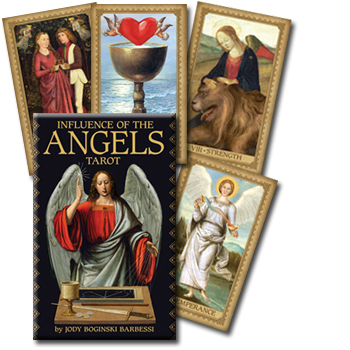 Angels' spiritual influence over human experience is beautifully portrayed in this gilt-edge deck through classic inspired artwork. The 184-page illustrated guidebook features in-depth descriptions, symbolism and angelic messages. In addition to the 78 tarot cards, two reference cards are included in this glorious set presented in a deluxe box with gold foil accents. Size cards, 3 in x 5in.